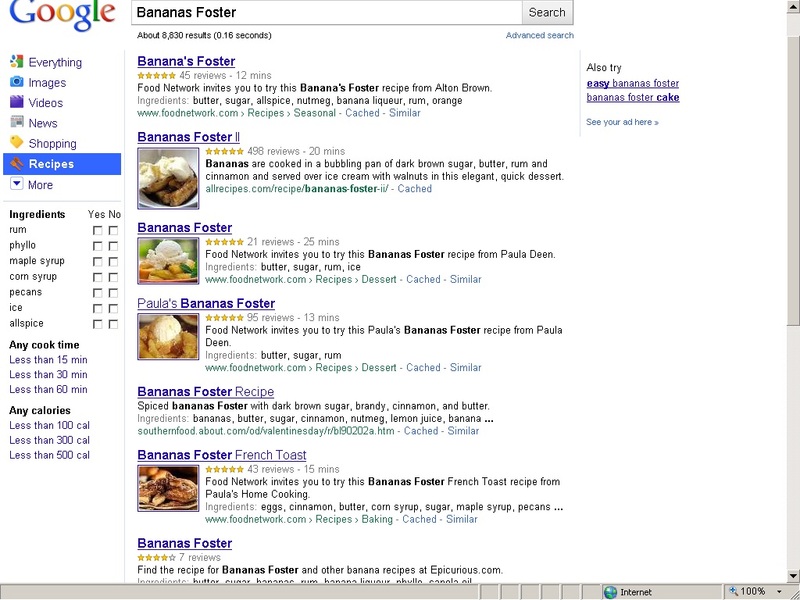 Google’s Recipe View a Delicious Idea! As a foodie and home chef, I am almost ashamed to say that I have stopped buying cookbooks. I used to love and treasure them. But with so many recipes available online these days, it almost seems a waste to spend the money. Of course, some are indispensable and I have my favorites with which I will never part (I may have my vegan slow cooker book cremated with me when I go!). But for the most part, I can find almost any recipe I want these days on the internet. Thanks to Google’s new Recipe View, recipe searches just got even easier! Mon Deiu, what would Madame Child say? Using the new Recipe View is easy-peasy and the functionality works like butter. [Yes, we are having a good time with this one!] Simply run a Google search for a recipe name or ingredients. When you get your list of results, simply go to the left-hand side of the screen and choose “Recipes”. When you click, your list is culled to only those results that are actually recipes. Want to refine your search further by focusing on specific ingredients, cook times, or calories? You can! Just go back to the left side of the window and use one of the new filters that has appeared. It is easier than boiling water! You can read more about Google’s new Recipe View here. Now get cooking! Etipedia: Get Your Manners On! The Etipedia® is our encyclopedia of etiquette, housing content from all of our published Emily Post Institute materials: books, surveys, videos, podcasts, magazine columns and online articles. And just who or what is the Emily Post Institute? Founded in 1946 by Emily Post and her son Ned, The Emily Post Institute has been promoting etiquette around the world for five generations. What started in 1922 when Emily Post published here seminal book on proper manners, Etiquette, has grown into a family business in which her descendents are still actively engaged. Good etiquette is in their blood! The Etipedia can be browsed, using the content tabs on the top, or even searched using keywords and/or phrases. It is very user friendly. Emily would approve! Try searching “food allergies” as a phrase and you will see what we mean. Did you know that proper etiquette dictates handling food allergies and dietary preferences (e.g., vegetarianism) differently? Well, now you do! Thanks to the Etipedia, formal gatherings and family meals no longer have to be frightening. Simply brush up before you go or bookmark it on your smartphone while you are there. Just please keep that phone off the table! Our personal favorite entry is the Top Ten Table Manners. Memorize them now before the holidays are upon us! Friday Fun: Think you have it bad? Check out Please Fire Me! With so many uproars and bombshells this week (re: ABA Journal, Thomson Reuters news, etc. ), the iBraryGuy team decided that our friends and colleagues could use a little levity today. The collective librarian blood pressure is too high. So we are bringing it down a few notches. Consider it a smile from us to you to get your weekend underway! So you think you have it bad? We all do once in a while. The true challenge is to not let a bad moment ruin a whole day or even a bad day ruin a whole week. Life is too short and too full of good things to dwell on those crumby times in which we wished things were better. Sometimes, all it takes is a little reminder that when things are bad for us, they are probably worse somewhere else for someone else. A little bit of laughter can go a long way. The next time your boss or your coworkers get you down, check out PleaseFireMe. It may just give you the giggle you need to drive those doldrums away. PleaseFireMe is more than a blog for unhappy workers. It is an online b*&#@fest for the “malemployed”. Perhaps you know some of these folks. They are the ones with the truly awful jobs . . . jobs that make the rest look like a walk in the park. It is amazing what people will say when given the forum to do so. Then again, it is sometimes amazing what people will tolerate to make a buck. PleaseFireMe is a revolution in employee feedback. The Extraordinaries: A little help goes a long way! Volunteering for a cause is not always as easy as it seems. Between our over-packed schedules and underfunded incomes, giving of your time and money to charity can be a daunting task. The fact that we are busy or that our budgets are tight, however, does not alleviate need. With a little innovation and big idea, The Extraordinaries is here to save the day! Have you ever heard of “micro-volunteering”? The old adage is that every little bit helps. Micro-volunteering is all about giving that very little bit of your time and talents to help someone out. The Extraordinariesis a site designed to make giving that little bit even easier. It is an online micro-volunteering network where people use their professional skills to solve nonprofits’ challenges in 10 minutes, or less. The opportunities listed are short, simple, and fun. Best of all, you can volunteer wherever and whenever you have the time. It doesn’t get much easier! Here is how it works: Non-profts sign up with The Extraordinaries and post challenges to the network. Volunteers also sign up (it’s free!) and, when they have time, are able to peruse the challenges. You simply pick a challenge that interests you and then post your response online. Again, it should take you – the volunteer – about 10 minutes or less. It may not seem like you are doing much. But that little bit you do can lead to a whole world of good. The Extraordinaries even offers an online Employee Volunteer Program (EVP) for corporations and other organizations that want to promote volunteerism among their busy staff. Now that is cool! The Extraordinariesis a for-profit social enterprise headquartered in San Francisco, CA. Their backing comes from leading social entrepreneurship organizations and a team of investors. Their site makes volunteering easy and fun. Won’t you join the iBraryGuy team and turn your spare time into action for good? LiveMocha makes learning a language fun! When looking to learn a new language, the choices for how to go about doing so seem endless. From immersion classes to software to books, the language education business is big and booming. If you want something simple, effective, and online, why not give LiveMocha a try? LiveMocha is a web-based system that puts a neat spin on learning a language. When you join, you are connected with native speakers around the world. It is not just about being taught or teaching a new language. No. LiveMocha builds a community of speakers and learners who support each other in practicing new language skills. And in joining LiveMocha, you actually DO get the chance to learn AND teach. You are encouraged to give back to the community. LiveMocha’s combination of online learning and community participation has won it numerous accolades, including being named one of Time Magazine’s Top 50 sites. Currently, over 25 languages are offered and over 6 million people are participating. Some course are free, while others are very affordable. As our patrons and our world become icreasingly more diverse, language skills are becoming a premium. It is never too late to start learning a new language or brush up on the ones you know. LiveMocha makes it fun and economical. What is not to love about that? “Awesome” in any language describes LiveMocha! SAVE THE WORDS! Why be sevidical? Add a little flosculation to your speech! Don’t look now… But sometime very soon, a word that probably never knew nor loved is about to become extinct. Every year, hundreds of words fade forever from English parlance. Friends, you have been asked to save the whales and save the planet. Today, the iBraryGuy team is joining with the awesome folks at Oxford Press to ask you to SAVE THE WORDS! Save the Words is both an interesting initiative and really cool site from the folks that bring us the venerable Oxford Dictionary line up. Fun and informative, it challenges users to adopt an endangered word and make it part of their usage. The idea is to keep that word from disappearing forever. How serious is the extinction of words, you may wonder. Well according to Oxford Press, only 7,000 words now account for over 90% of what we communicate on a daily basis! What is happening to the rest of the millions of words in the English language? Other than simply taking up space within the crammed pages of the biggest, most comprehensive dictionaries, they are fading forever into obscurity. In the months to come, we here at iBraryGuy are going to give a little boost to Save the Words by featuring an endangered word weekly. We hope that before you bring a new word into existence, you will consider one of these orphaned words for adoption. That’s right. You heard it here. Why not make word adoption, your first option. Nothing on the tube? Try Blip.TV! These days it seems like whether you subscribe to cable or satellite, even if you are still using rabbit ear antennae, there is never anything good on television. Hundreds, if not thousands, of stations from which to choose and yet most of us still end up channel surfing. Many times this is because TV programming runs on its own schedule and not ours. DVRs and other recorders can help, but you still have to know when your programs are on to record them and then remember to set the recording. Well, why channel surf in hopes of finding a show, when you can web surf to find exactly the shows you want? Blip.TV is a web site chock full of original programming that is available when YOU want it. Blip.TV is NOT network television. Nope, it is better! This is independent creativity at its finest. From sitcoms produced by college comedy troupes to cooking shows filmed right in the host’s kitchen, Blip.TV is unique programming by and for “the little guy”. How expansive are its offerings? Well, the site actually already hosts over 50,000 independently-produced Web shows. Network TV and cable can’t touch that! The iBraryGuy team’s personal favorite, either because we are always on diets and like to torture ourselves or because we simply love food, is Cindy Harris’ “Nothin’ But Muffins”. Cindy has taped almost 20 episodes in which she bakes and shares her favorite muffin recipes. The best part of it all is that with Blip.TV, we can watch any of the episodes any time we want. Episode 17’s strawberry muffins are on constant replay in our homes! Like normal television, the programming on Blip.TV is full of the good and the bad. What can you do? Some folks put a lot into their productions, others not so much. It is up to you to choose your favorites. The good news is that Blip.TV does enforce some fairly rigorous standards and, as part of its commitment to community relations, does not allow adult or pornographic material. This is family-friendly broadcasting, folks. So the next time you are tired of the television line-up, put down your remote and pick up your keyboard. Tune into Blip.TV and take control of your programming! To round out the week, we thought we would recommend a little fun. Today’s site actually came to our attention thanks to the fine folks at #Fastcase and their exellent blog. They recently featured some cool word art that they made by feeding the text of seminal Supreme Court cases into an online app called Wordle. Wordle is a sweet, java-powered application. You can cut and past some text into it, direct it to a web page that has an RSS or Atom feed, or give simply enter a Del.icio.us username. Wordle will then analyze the text and tags to create a word cloud. But what’s so artistic about a word cloud, you may ask. Well, Wordle actually lets you control colors, layouts, fonts, languages, and even which words to include. The results can be quite stunning! Wordle is free to use and you can even use the Wordles you create for your own commercial or personal purposes (t-shirts and bookcovers come to mind!). Not a bad deal! Below is the Wordle created when we feed our own iBraryGuy RSS into wordle. We gave it a bit of an African flare in deference to the World Cup. Make your own. Enjoy!